This solo exhibition by Candida Höfer, one the most outstanding figures of Kunstakademie Düsseldorf, which offers a selection of her late 40 years’ work in a setting planned in collaboration with the prestigious studio of architecture Kuehn Malvezzi. The exhibition ‘PROJECTS: DONE’ includes works belonging to projects realised between 1968 and 2008: Liverpool; Flipper [Pinball Machine]; Räume [Spaces]; Franz West; On Kawara; Kuehn Malvezzi; Zwölf. Die Bürger von Calais [Twelve, The Burghers of Calais]; Zoologische Gärten [Zoological Gardens]; Possessions. The series Türken in Deutschland [Turks in Germany] and 80 Pictures, taken in the 70’s and the 80’s, are shown here as a slide projection (1979) and double slide projection (1996), respectively. Furthermore, the exhibition at MARCO shows a film of the catalogue, also conceived as a project within the context of this exhibition. On the occasion of ‘PROJECTS: DONE’, MARCO has published a free Guide including images and technical data of all the works in the exhibition, together with the floorplan. On the occasion of the show by Candida Höfer, the Library-Documentation Centre at MARCO shows a selection of solo exhibition catalogues by the most outstanding photographers of the Kunstakademie Düsseldorf, addressed to users and general visitors. They will be available to the public during the regular opening hours of the Library and throughout the whole exhibition period. ‘PROJECTS: DONE’ is showing works from projects by Candida Höfer completed between 1968 and 2008. Photographer Candida Höfer, the architects Kuehn Malvezzi, who developed the displays in close cooperation with Candida Höfer, and the curators of ‘PROJECTS: DONE’ have placed the interplay between photography, architecture and presentation in the centre of their common project. Here a ‘project’ is seen as a form of work that either runs for a previously planned period of time and/or is completed — ‘done’ — once a goal defined in its theme has been achieved. So the works chosen to be shown are distinct from work that is better described as regular artistic activity. This difference is not necessarily discernible in the project themes. Certainly some of them form a contrast with Candida Höfer’s usual subject matter at a first glance, the works relating to Flipper [Pinball Machine], for example — dating from Höfer’s early working years — , intended as an publication project, or the Liverpool complex, with its numerous street images. But these works too are not unrelated to Candida Höfer’s central theme of creating images of space, of its different content, its use, what a space shows and how it shows it. The distinction lies more in the limitations set by each project, and in the allocating the images to each particular project. So the exhibition is also an invitation to investigate the projects through the lens of this kind of inner order. Another project is the presentation of the exhibition itself, which Höfer has developed jointly with Kuehn Malvezzi. This project is based on co-operation between the artist and the architects that started in 2002, when Kuehn Malvezzi converted the spaces in the Binding Brewery for Documenta 11, at which Candida Höfer showed the Bürger von Calais (Burghers of Calais). Addressing exhibiting as a project conceptually revokes the division into projects and regular work that has just been stressed: projects — it becomes clear — are ‘done’ only when they are exhibited, and every exhibition drawn from an artist’s regular work is for its part ultimately a project with a prescribed time limit and a theme — in this case: the project for showing spaces as images, and at the same time showing how spaces show images. This showing of images can take place in private, possibly semi-public spaces, like On Kawara’s Date Paintings in private collections or in a conscious architectural act, as in the images relating to Kuehn Malvezzi’s exhibition architecture, both exhibited projects as well. Thus in this exhibition the artist’s practices are combined with the architects’ practices, and require comparative understanding of the different. Candida Höfer studied at the Kunstakademie Düsseldorf, first film with Ole John, then photography with Bernd Becher. Her work has been shown in museums such as the Kunsthalle Basel, the Kunsthalle Bern, the Portikus in Frankfurt am Main, and the Hamburg Kunsthalle. The artist has participated in group shows at the Museum of Modern Art, New York; the Power Plant, Toronto; the Kunsthaus Bregenz; and the Museum Ludwig, Cologne. 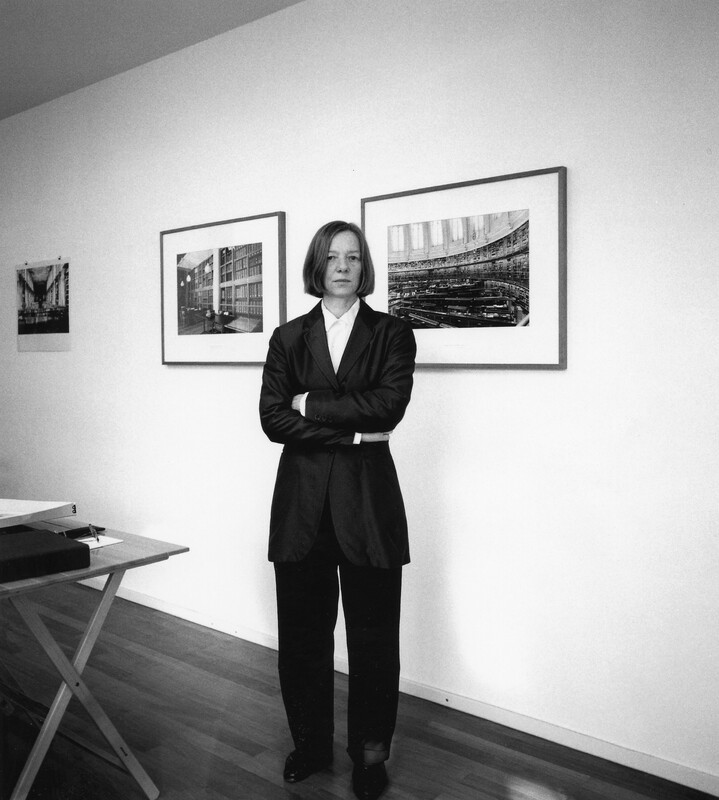 In 2002 Candida Höfer participated in Documenta 11, and in 2003 she represented Germany at the Venice Biennale (together with the late Martin Kippenberger). The artist lives in Cologne. Kuehn Malvezzi was founded in Berlin in 2001 by the architects Simona Malvezzi, Wilfried Kuehn, and Johannes Kuehn. In addition to buildings for public and private clients, the architects have designed the architecture for numerous exhibitions. They designed the exhibition spaces for Documenta 11 in Kassel (2002), the extension to the Hamburger Bahnhof — Museum für Gegenwart for the Friedrich Christian Flick Collection (2004), and the Julia Stoschek Collection in Düsseldorf (2007). They are currently converting the baroque Unteres Belvedere (Lower Belvedere) in Vienna into an exhibition venue for modern art, as well as designing an expansion to the Museum Berggruen in Berlin and new presentations of various historical collections, including the Liebieghaus Frankfurt, the Herzog Anton Ulrich-Museum in Braunschweig, the Kunstsammlung Nordrhein-Westfalen, and the Kunstgewerbemuseum Berlin. Their work has been shown internationally in solo and group exhibitions, including in the German Pavilion of the 10th Biennale of Architecture in Venice in 2006. When preparing for an extensive exhibition like Projects: Done, Candida Höfer places prints of the images she has selected in gray or black boxes, most of which are labeled by city or country. Sometimes the label reads “Liverpool” or “Madrid,” sometimes “Portugal” or “Mexico.” The boxes are an imaginary mapping of various stations that are distinguished not so much by typologies of space as by specific situations in spaces. With Projects: Done, none of these boxes of photographs are labeled. It is the title both of an exhibition and of a book. Whereas several of the projects, such as On Kawara and Liverpool, are unlikely to be continued, others, such as Zoologische Gärten (Zoos), Possessions, and the seeking out of locations of museum- like presentation, are not yet finished. From the perspective of the exhibition organizers, however, presentation in a museum or a publication represents the temporary completion that a public showing requires and also produces. This is a central aspect both of Höfer’s artistic oeuvre and of the exhibition itself. The projects presented tell of designed places, not all of which are accessible to the public, in which specific display systems and readings of what is displayed activate public spheres. In collaboration with the architects Kuehn Malvezzi, display systems were developed for the exhibition that not only strip the many venues of the On Kawara project of their privacy, but also ultimately bring the archived prints into the exhibition space in the form of the recent publication Candida Höfer. On Kawara. Date Paintings in Private Collections. The presentation of the project in the exhibition transforms the book into an exhibit: in two glass-covered table vitrines, the individual pages are spread out in two rows in each, resulting in opposite motions in space. The four rows contain a selection of the roughly one hundred sites that were visited and organize them according to the chronological sequence of the artist’s various travels. Projects: Done exhibits exhibiting. Türken in Deutschland (Turks in Germany)—a multipart work consisting of a presentation of color slides and a series of black-and-white photographs with which Höfer successfully applied to the Bechers’ class at the Kunstakademie Düsseldorf in the mid- 1970s—addresses this theme as well. The images depict everyday situations in a “space of life-styles” in which, according to Pierre Bourdieu, social classifications are distinguished by clothing, language, taste, and consumer behavior. But the images do not put “the other” on display, nor is it a voyeuristic gaze that speaks. Höfer must have visited some of the sites several times, for one image shows a sixmember Turkish family in their living room, whereas another image in the same place shows only the husband and wife, wearing different clothes. Several images show Turkish merchants in their stores in Cologne, Hamburg, or Düsseldorf. Their store displays could have been taken from the 1964 exhibition The American Supermarket at the Bianchini Gallery in New York. This quiet observation of Capitalist Realism, as the one-evening event Leben mit Pop (Life with Pop) at the Berges department store in Düsseldorf in 1963 was called, is still found in subtle ways in Höfer’s work even today. For example, in the images of reading rooms in the library at the Van Abbemuseum in Eindhoven (V and VI, 2003), designed by Maarten van Severen, bright colors pop into the silence of contemplation, generating an antidesign of everyday forms. From Türken in Deutschland, our gaze shifts to Casino Lissabon II 2006 (Casino in Lisbon), in which Höfer photographed the “heart, the social center” of the casino (according to the casino’s Web site), which opened in 2006. “Photograph” is, however, not a very apt term here. The English phrase “to take a picture” is closer to her approach to spaces. Taking a picture of a space: a broad white screen frames an auditorium as if it were the stage below which the DJ’s stand is prominently located. Outside this passe-partout inherent in the space lies the bar and restaurant—in Höfer’s work, however, this venue is much more than a background. The picture appears to be nested, doubled, and reflected. A picture within a picture. A “mise en abyme.” If the photographic image is hung in such a way that it can be seen from a great distance in a long visual axis, this confusion is reinforced. The single-point perspective often used by Höfer opens the large-format pictorial object into the exhibition space. Where does the depicted space end? Where does the real one begin? By this point at the latest, it becomes clear that Höfer’s photographic images are not documentary reproductions of a space; rather, the image itself becomes a space. It is not the depicted space that is real but rather the one imagined as a result of the image. Looking at the image is like looking at a map. In an interview Höfer remarked: “Rather I want the image to contain stories, not to tell stories, not to be talkative. I want them open for the stories of people wandering through these images with their eyes, to be open to discoveries, to invite them to spend some time with the image. And photographic images, like maps, invite you to use plenty of time.” We have long since known that mappings can be neither complete nor objective, since they are subject to political, cultural, religious, and even historical paradigms. Even Google Maps does not show a map of the world as it is but instead offers a visual apparatus that makes it possible to travel virtually through photographs of streets, squares, airs, and seas. Höfer’s images of rooms like those in the casino but also her works “Galleria Gió Marconi Milano I 2005,” “Schauspielhaus Hannover 2005,” and “Museum Morsbroich I + II 2008” can be read as mappings of spaces, of sites, with which the viewer navigates the images, just as Kuehn Malezzi creates environments with its architecture that function as hosts oriented to the specific situation. Ultimately, it does not matter whether the events actually occur in the space or only in the imagination. In 1973, Susan Sontag argued in “In Plato’s Cave,” her first essay on photography, that photographing is a way of collecting the world. This topos is reflected in Höfer’s 80 Pictures. The title of the project recalls the story of the British gentleman Phileas Fogg, whom Jules Verne sent around the world in eighty days at the end of the nineteenth century. It is Höfer’s only project thus far that treats text and image as equals; however, the designations of time and place—especially specific terms like “grey,” “brick,” or “show-case,” each on its own text slide—recall today’s tags, which are used to personalize images by adding titles to them on Internet portals such as Flickr and Facebook. The double slide projection is actually a double slide installation: 80 Pictures not only requires projectors in the exhibition space that can project two text slides followed by two image slides; the surrounding space and the projection also become constitutive installation elements of the presentation. The present publication translates this media presentation into a series of images against a black ground. The project Flipper (Pinball), which is being shown for the first time as part of Projects: Done, is based on several trips. Much like the projects On Kawara and Zwölf. Die Bürger von Calais (Twelve. The Burghers of Calais), in Flipper an object is the point of departure for every inspection of the scene: the pinball machine (Shangri-La, pachinko) becomes the lens of drifting the streets of Cologne, Düsseldorf, Wenningstedt, Paris, London, and Brussels. Originally planned as a book project, this early project spent more than thirty years in a box. It is exhibited in a loose but compact series of nearly fifty original vintage prints laid out in a glass-covered table vitrine to create a single visual object. The exhibition display by Kuehn Malvezzi—a horizontal display case—spreads out before us not only a sociological history of pinball but also an itinerary. Höfer visited about fifty sites for this project. The large number of photographs—often found in later projects as well—is here a manifestation of a unique language with which the pinball arcade, which is frequently used only by men, is appropriated. Whereas the photographs in the vitrine disclose their own temporality, the present publication accelerates the speed of the pinball images: readers can flip through the multipage sequence of full-page images like leafing through illustrations in a magazine. Just as the pinball machine in its various locations sometimes looks like an entertainment, a site for socializing, or, in rigid rows, a sculptural object, Höfer’s project Zwölf. Die Bürger von Calais presents Auguste Rodin’s Les Bourgeois de Calais— which was commissioned in 1885 and since 1895 cast in bronze in twelve editions—in different narratives at their present locations. Höfer is not interested in their art-historical interpretation. She focuses rather on the possibilities of presentation that turn the burghers into a cultural asset (“The National Museum of Western Art Tokyo II 2000”), make them seem temporarily stored (“Kunstmuseum Basel II 2000”), decorate the museum café with them (“The Metropolitan Museum of Art New York I 2000”), or make them the symbol of a city (“Place de l’Hotel de Ville Calais I + II 2000”). Much like an index, the project includes various forms of presentation that apply only to each specific place. It reveals an exhibition policy that was the basis of the invention of the bourgeois museum in the mid-eighteenth century. The exhibition Projects: Done begins in the Schloss Morsbroich, a baroque castle. At the same time, it marks a temporary caesura in the collaboration between Candida Höfer and Kuehn Malvezzi that began with Documenta 11 in Kassel. In 2002, Zwölf. Die Bürger von Calais was exhibited at the Binding brewery in Kassel, in a site that the architects had converted into spaces for art. Two years later, “Binding Brauerei Kassel II 2004” was taken. On the one hand, traces of both use and nonuse tell of the past presence of art and its viewers and, on the other, illustrate a temporality of exhibition that remains hidden to an ordinary gaze. Usually preceding exhibition in space and time, several images—which I would call the “verso of exhibition”—show sites of archiving and preparation (“Biblioteca do Palácio Nacional da Ajuda Lisboa I 2006”), of conservation (“Museum für Islamische Kunst Berlin II 1990”), of interim spaces (“Alvar Aalto Kulturhaus-Wolfsburg II 1998”), and of transition (“Festspielhaus Recklinghausen XIII 1997”). Whereas the early project Liverpool could be read as a travel-related mapping of a city, this exhibitions shows, with works such as Haus des Rundfunks Berlin (House of Broadcasting, Berlin) and Kunsthistorisches Museum Wien (Art Historical Museum, Vienna), sites that in Höfer’s photographs look more like exhibition objects. Various ways of hanging them can distinguish them. For example, Niederländische Botschaft Berlin (Dutch Embassy Berlin) is presented in a hanging that surrounds the space. Much like a compound eye, the numerous closely hung photographic images generate an overall picture of the building. By contrast, the images of Zoologische Gärten generate a wall tableau of four rows that, in the language of graphic designers, is hung flush left. Zoos are also places where the world is brought together. The designed enclosures house live exhibits that turn any zoo into an outdoor museum. The simulated living spaces of the animals probably also say something about the culture in which fenced-in preserves are found. There is one work in Projects: Done that is the only project in which the images are shown neither as slides nor as prints: Possessions assembles a selection of Höfer’s works whose ownership has been transferred to the Candida Höfer-Stiftung (Candida Höfer Foundation) since 2004. The images in this project do not de facto exist physically, which is why in the present volume Possessions is published in the form of a text. The transfer of a virtual image file to a space is an essential part of the installation that was developed in 2008 for the exhibition Candida Höfer: Werkgruppen seit 1968 (Candida Höfer: Groups of Works since 1968) at the ZKM in Karlsruhe. The spatial shift takes up a work situation: consisting of a chair and a table with a computer screen, roughly a hundred images go past in a loop of digital film. There may be some duplicates with the images in the exhibition, but here the repetition produces a difference in two respects: on the one hand, the various localizations of the same image appeal to a perception that grasps the exhibited image in the surrounding space situationally and, on the other hand, each photographic medium demands its own temporality. Whereas the essence of this project is directed at the future in the literal sense—the Latin verb proicere means “throw forward”— the public presentation marks a moment of fixing something in time and space that is manifested both in the exhibition and in the publication Projects: Done in various aggregate states but with a similar layout. At the beginning of this publication, Candida Höfer invites the reading flaneur: “How to read this book: Read it like a walk through an exhibition.” Before us lies another project box spread out—filled with past future. ‘Projects’ — and not commissioned works? I find it difficult to work in situations involving commissions. I know that since I submitted photographs of hunting parties to a magazine. ‘Projects’ — for me — means above all being given possibilities and opportunities for access; and then it means access for a limited time, with a beginning and — at least temporarily — an end, but without any external expectations as to what comes in between or may come out at the end. No. The works selected were made between 1968 and 2008, and the preparation for the exhibition was an encounter with the past. In working with the specific photographs, however, ‘past’ doesn’t quite describe what I have experienced: looking at the photographs from the past has been like looking at the present for me. These photographs are just as valuable to me as the photographs I am making now. That’s a feeling I always have when I work with photographs from the past. The past tense is justified to the extent that they are photographs I took in the context of earlier projects. But ‘done’ for me indicates a form of past that extends into the present. It’s about a continuous passage of time, from the time when the photos were taken to the time of making the prints; it’s about images that remain inside you, and about the after-effects of working on photographs. And it’s about effects on my current perception — the way I look at my surroundings — and about possibilities for new photographs. It’s not about age as such, about an assigned date or place in a past. It’s about something that cannot be closed off, or clearly assigned to a year, for example. Is that also why there are new, unfamiliar forms of representation, as in the Flipper [Pinball] photographs? The form of this presentation evolved in a conversation about forms of presentation. I listened to the others without contributing much, as is often the case with me. And then all of a sudden I made the decision, just as I often do when looking for a shot for a photograph; I decided that the casualness of — or, better, the emphasis on — sequence in the photographs finds its adequate expression in a sequencing representation. For me, these photographs are like a continuous text, much like 80 Pictures. A remembrance from the film class? This form of presentation attempts to return some of the energy that is in a sequence of events, and this energy of sequence is for me an essential quality of film as a medium. I like that very much about film. Nevertheless, film is not the medium for my work. I tried it, after all. For me, it’s more about the sequence of time which can be found in a single photograph and — in exhibitions — about the sequences which are created by individual ‘still’ images hanging next to each other. Much like the On Kawara project? In part. As in the book for that project, the photographs from the exhibition are arranged in the vitrine in the same chronological order in which I had taken them. And, of course, On Kawara’s paintings themselves are ‘time.’ This form of depiction has, at the same time, a very private meaning for me; it is a juxtaposition of personal experiences that I was fortunate to have had with the people who allowed me into their private spaces. For making these experiences possible, especially in Japan, I am really very grateful to On Kawara and his wife, and especially to his daughter and Keiko Shimada, both of whom accompanied me while in Japan. At the same time, the photographs exhibited represent another form of display: it was important to me to display them in such a way that you look down at them from above. They are the illustrations for the book, and you see them the way I saw them as I was working on the book. Since my series about Turks, there haven’t been people in my photographs anymore — there are only empty spaces now? That project — more precisely, the two projects Türken in Deutschland [Turks in Germany] and Türken in der Türkei [Turks in Turkey] — represents an important time for me, and it was also a transition. It was about my immediate surroundings. My work on this dragged on for nearly five years, and more and more I got into a state of uncertainty. I knew that I wanted to go on taking photographs, but I wasn’t sure which direction I would take. That only became clear during my studies at the Kunstakademie Düsseldorf, even though the kind of spaces and formal arrangements that I had encountered with the Turks occupied me very much. Their love of ornament when designing shopping displays, for example. I see such connections more clearly now, in retrospect. But I had already felt an attraction at that time. And these projects were never really finished either. The people, the places, and the arrangements continue to exist in the surroundings in which I live. I still see them every day. But I no longer feel the need to capture them in a photograph. At most, the only project that is completely finished, if I can use that word, is the Liverpool series. Liverpool was a place at a time that no longer can be repeated and that no longer endures in that form. So it is ‘done.’ And then followed the spaces. From inside. But also from outside? Die Niederländische Botschaft [The Dutch Embassy]? I don’t rule out exterior shots. Nor spaces with people. There are preferences and reasons for the preferences. But there are no dogmas for me. There are exterior shots in Zwölf. Die Bürger von Calais [Twelve. The Burghers of Calais]. There it was important to me to follow what such an animated and yet, of course, rigid sculpture does with space and vice versa. Space is also the surroundings in the landscape. Die Bürger is also a story about forms of displaying. In the case of Die Niederländische Botschaft, it was something similar, I think. But it was above all a challenge made by the building. A kind of provocation too. I did not want to skirt that challenge. And in the end I had to admit that I would not have been able to come to grips with it without the help of my assistant Ralph Müller and the artist Susanne Bürner, who helped me with that project. In general, organization seems to me to be a key word for that way of taking photographs. And Die Niederländische Botschaft in particular posed other challenges as well: they were already starting to furnish the building, even though construction was not yet complete; security regulations had to be observed. The time pressure always there seemed even greater than usual in that case. Time pressure is always there? Although my objects cannot move — even though they can occasionally be destroyed — I am always working under time pressure. Because I prefer to photograph spaces without people, when possible, I have to work at special times. Before opening hours but when there is already daylight. After opening hours but also when there is still daylight, if possible. Or, at whatever time they allow me to work. I do hear that a lot. An assistant who was organizing my negatives recently said to me that working with negatives showing people is much more interesting than always just spaces, spaces, and more spaces… I personally don’t find it boring yet. For me, there is still, again and again, the excitement of the first encounter. And then I encounter them again in very different situations: not only when photographing, as I’m standing in the space, but also when working on the print, when the photograph of the space becomes an image that has its own light and its own colors and forms. And then when I am making preparations to show the photographs, when I’m assembling photographs, when context becomes important, the relationship of the photographs to one another, to the space in which they are shown — all the things that change every one of the photographs yet again. What interests me is what is different in something I see again and again, and what is similar in different things. That is, first of all, ‘types of spaces’ — opera houses, museums, theaters, and libraries, of course, but also other things, new things, and perhaps even old things to be discovered anew. In the process, I try to see what happens with these types of spaces in various surroundings, in different countries. I don’t do that systematically according to a preconceived plan that I work through. I rely on random occurrences during my trips; I track down things I’ve found in my reading or recommendations; I listen and ask. I am always curious about legends, like the Teatro Colón in Buenos Aires, for example. Once I have decided, then I do become systematic; that’s when the organization begins. Even though I don’t need any lighting equipment, because I always work with the existing light of the space, just tripods and my cameras, travelling with equipment and film has become more complicated, if only because of the security requirements. Then, as I already mentioned, the times for the photographs have to be organized, access permission has to be arranged, and so on. That alone becomes a ‘project.’ But it is like flying somewhere; the complications en route are quickly forgotten, again and again, when you are there. I have just finished a longer work in Florence that was not exactly simple to organize, and a very well-organized one in the Neues Museum in Berlin, a very impressive place, and now I am hoping for opportunities in Naples — yes, Naples, a city I like very much — and perhaps Rome too. Brazil still interests me a lot as well. The architecture of the past fifty years would not exist without media, without photography. Photography and architecture have gone hand in hand since Le Corbusier and Mies van der Rohe. When you see the early photographs of Le Corbusier’s villas, much is staged. What do you consider the ideal photography for architecture? Does Candida Höfer move in that direction? For me, Candida Höfer’s photography has always been very direct, an image of the way I experience space: the spaces are undramatic; the light is unspecific; and the scene is empty. That means the event is absent, but you can imagine it. And that is really the maximum possible spatial freedom that I can feel. This laconism, this total absence of dramaturgy, didacticism, or any kind of display. Always with such long exposure times. So it’s a form of invisible architecture? And also of invisible dramaturgy and invisible attraction. Something is there, but you can’t really put your finger on it. You want to walk into Candida Höfer’s photographs. They are photographs that are real, even though they are two-dimensional, that give the impression of an undertow. And this undertow is really quite rare. For example, Wolfgang Tillmans’s photographs, which also move me very much, aren’t spatial at all and don’t convey depth. They are deliberately planar. By contrast, Candida Höfer’s photographs have this enormous depth. Depth, after all, means being drawn into a space you aren’t yet in. Space is the view away from here, toward something else, a kind of removal of boundaries. You are no longer occupied with the here but with the there. This ‘there’ is the next ‘here,’ which results in kinesthesia. We see that aspect in the exhibition as well. Exhibition as a model case of architecture is interesting because you can try out kinesthetic models. For me, Candida Höfer’s photographs are also kinesthetic models. She needs kinesthetic models, because one curatorial and also conservational aspect of the photographs of Andreas Gursky, Thomas Struth, Thomas Ruff, and Candida Höfer is, of course, that these photographs are framed almost like Don Judd’s furniture, with large reflective surfaces. And at an exhibition like the one in Morsbroich, I would like to see the curator, the architect, or the artist come to term with reflections, with reflections of framed photographs. The exhibition by Wolfgang Tillmans at the Hamburger Bahnhof in 2008 was wonderful, precisely because he integrated the dialectic of reflective and non-reflective, of opaque and transparent. I find curators who exhibit photographs give far too little thought to glazing. I think that it’s an opportunity to add another aspect — namely, the almost invisible architecture of glass. In the exhibition in Morsbroich, there is not only glass over the photographs but also mirrors and reflections as well as various vitrines. Candida Höfer’s photographs at Schloss Morsbroich are now hanging there as a reflection in the castle: there are photographs of the historic mirrored hall, now hung directly opposite that room, at the other end of a row of baroque rooms. As a result, they weave the building and the exhibition into the path that opens into the hall. The vitrines for the exhibition were designed as tables that stand in the room, facing the viewer quite directly like long atelier tables, but also establishing distance at the same time, because of the glass. There is an almost invisible glazing close to the photograph in the On Kawara vitrine as well as the contrasting glazing of the Flipper [Pinball] vitrine, which is truly conceived as a space, as a box in which the many photographs from the 1970s are placed closely together and sealed off with a clearly visible pane of glass as a lid. Vitrines are an important subject these days. For we have not only more material but also more material that obtains the status of an artwork only by being isolated. Are vitrines a problem for you? Your ordinary vitrine is a kind of sarcophagus. What you really see is a dead object that is being kept in an artificial waking state by providing it with climate control, delicate lighting, and precisely controlled humidity. Moreover, solvent- and acid-free materials that don’t produce any vapors are used in making vitrines. A vitrine is a totally aseptic place. A shame, since many love vitrines: André Breton, Joseph Beuys, Marcel Broodthaers, James Lee Byars, and the early Jeff Koons. …but also more and more objects — Fluxus leaflets, for example — that only acquire meaning because we isolate them somewhere in the form of a sarcophagus. That is why we have already designed many vitrines and are constantly designing new ones. And we keep asking ourselves: How should this vitrine be correctly employed? Can it simply stand horizontally in the room? It should not look like an artistic work. In a Beuys exhibition you can’t put vitrines you designed yourself in the space. In certain exhibitions we have inserted vitrines into the wall vertically to bring them in line with the pictures; we’ve created fluid transitions between vitrines and frames in order to translate the fluid transition between artworks and documents. I think that vitrines are an important topic, but you have to approach it very deliberately. Otherwise they end up, as in many museums, like furniture: the vitrines stand in the room like a bookcase with a few books in it. We resist that kind of vitrine. For me, vitrines are, if you approach them deliberately, the museum theme par excellence: vitrines are typologically and technically the museum in miniature. The museum in miniature. As it was for the surrealists, for whom vitrines were very important. A universal museum, says Jeff Wall, implies not just daylight but also moonlight. The night! If we go back to the first museums and look at Hubert Robert’s painting of the Louvre, for example, it is striking that the Louvre looks like a ruin, but you can’t talk about daylight here: it was an open ruin and there were candles lit! How do we see the change from day to night in the ideal exhibition, or should day and night be able to alternate constantly? The museum is by nature artificial — a paradox, really. Day and night in a museum are artificial states. These days we can even simulate daylight with its variations in such a way that, filtered through a skylight, it seems completely natural, even though it is computer-controlled artificial light. Conversely, darkness in a museum is a precisely calibrated state in which the exhibit, despite its weak direct light, is the brightest surface in the room. In such a room, the other sensory perceptions are heightened immensely, and thus so too are other forms of physical orientation. It seemed important to Candida Höfer, the curators, and us to show both slide projections, 80 Pictures and Türken in Deutschland, in their original form in the exhibition, and not to use a digital projector, which produces a much stronger light. Hence, both rooms had to be relatively dark, and the noise of the slides changing is more pronounced. At the same time, this demands of the viewers a much larger — that is, longer — process of adapting in moving between the bright and dark rooms. We have never used a curtain or a door in an exhibition, even in exhibitions with a lot of media art, such as Documenta 11 or the Julia Stoschek Collection. We are convinced that all works have to be directly connected to a space, that everything is related by the visitor’s movement. The kinesthetic moment is seriously disturbed by a curtain. So is orientation. I believe that a room should be open. But by installing pockets of space, so to speak, by hanging fabric, as we have done before, you create intermediate spaces that add an acoustic and visual brake but at the same time relate the works in a certain way. Openness does not mean that all the works have to be presented next to one another in one big space. But it has to be possible to experience them in a narrative sequence, so that they become parts of a temporal sequence like in a film. That is how memory is created. Architecture is the moment in between. We work intensely on these thresholds and transitions, on the blank spaces. But with no spill over, no excessive barrage of sound? At least not enough that you are aware of it. After we had calibrated the acoustics of all the rooms in the Julia Stoschek Collection, it was a deliberate curatorial decision to place Monica Bonvicini’s particularly noisy work Hammering Out in the middle of the exhibition and thus for once obtain a very powerful spill over. One kind of spill over. That’s crucial! You just spoke of hanging fabric: what struck me at Documenta 12 was that Ruth Noack and Roger M. Buergel quite consciously played with the topos of modernity, with the tension between the bareness of a wall and covering it. We know that it can work, of course, because Mies van der Rohe, with his Barcelona Pavilion , consciously demonstrates the effectiveness and beauty of curtains — one of the nicest topoi. But so do the decorative marble structures. Artists, collectors, critics, and art dealers criticized Documenta 12: Oh, those awful curtains! Textiles, fabrics, coverings as such should no longer be allowed back in museums according to them. It’s about bare walls. ...An exhibition shouldn’t be presented like a private collection or a private cabinet of curiosities. Otherwise the material suddenly becomes — unlike in Semper’s or Mies’s work — something like the velvet lining of a case. As Walter Benjamin described it: the bourgeois interior as a case, which represents a precise impression of the individuality of the owner but no longer permits any freedom to move. By contrast, the interior of arcades that Benjamin describes is a place — and it begins in the city — that is not an impression of a personality, not personally identified with anyone, but where everyone is at home in a sense. An exhibition is more powerful when it is not so much a case as an arcade.